Framed limited edition film cell from the hit The Wizard of Oz movie. Features 8 clips of real film, a poster image, a name plaque, and a certificate of authenticity! Measures 20-inches wide x 11-inches tall. 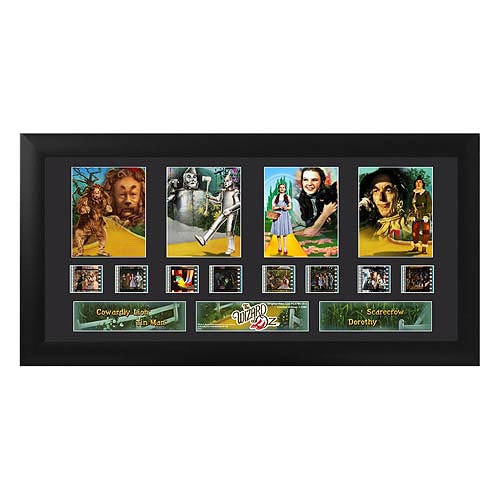 The Wizard of Oz Series 1 Quad Film Cell is a limited edition of 2,500 pieces that contains 8 clip of real film from the hit The Wizard of Oz movie, glorious images of Dorothy Gale, the Tin Man, the Cowardly Lion, and Scarecrow, along with a name plaque. These elements are double matted and placed within a beautiful black frame that measures 20-inches wide x 11-inches tall and comes with a Trend Setters certificate of authenticity. Made in the USA.